Baobab (Adansonia Digitata) other names: Abebrødstræ, Adansonia, Adansonia bahoba, Adansonia baobab, Adansonia digitata, Adansonia situla, Adansonia somalensis, Adansonsia sphaerocarpa, Adansonia sulcata, Adansonie d' Afrique, Affenbrotbaum, African Baobab, Afrikaanse Kremetart, Afrikanischer Baobab, Albero Bottiglia, Albero di Mille Anni, Apebroodboom, Apenbroodboom, Arbre à Palabre, Arbre Bouteille, Arbre de Mille Ans, Bao Báp Châu Phi, Baob, Baoba, Baobab Africain, Baobaba, Baobabu, Baobab Afrykanski, Baobab Agaci, Baobab del África, Baobab Africain, Baobab Africano, Baobab de Mahajanga, Baobab de Mozambique, Baobab Fruit, Baobab Milk, Baobab of Mahajanga, Baobab Prstnatý, Baobab Seed, Baobab Seed Oil, Baobab Tree, Baobab Wlasciwy, Baobab Yemisi, Baovola, Bawbab, Boab, Boaboa, Boringy, Bottle Tree, Boy, Bozobe, Calebassier du Sénégal, Cream-Tartar Tree, Dead Rat Tree, Dton Baobab, Ethiopian Sour Bread, Fruit de Baobab, Graine de Baobab, Gros Mapou, Harilik Ahvileivapuu, Hou Mian Bao Shu, Huile de Graines de Baobab, Imbondeiro, Judas Fruit, Judas Fruit Trees, Kremetart, Kremetartboom, Lait de Baobab, Maymun Ekmegi Agaci, Mboio, Mboy, Monkey Bread Tree, Noce d'Egitto, Pain de Singe, Rainiala, Reniala, Ringy, Sefo, Shagar El Bawbab, Shagar Khubz El Qurud, Sour Gourd, Upside-Down Tree, Vanoa, Vontana. Often described as "grotesque" by some people, the principal stem of a mature baobab tree, scientific name Adansonia digitata, may grow to mammoth size - as much as 28 meters in circumference. On the other hand, baobab trees rarely grow to a height of more than 25 meters. Its trunk is massive, generally thick and cylindrical in shape, and broad tapering branches rise from it. Interestingly, the branches of a baobab tree bear resemblance to a root system. This is the main reason why many people describe baobab as an "upside-down tree". In fact, there is a popular folklore that talks about the reason why God planted this tree upside-down. What is more interesting is that several traditional people in Africa actually believe that this tree grows upside-down! The stem of baobab has a smooth, greyish-brown bark layer that may be quite thick - anything between 50 mm to 100 mm. The bark of baobab can be folded in various ways and seamed right from the years of the plant’s growth. The leaves of baobab are of the size of an adult’s hand and are branched into five to seven leaflets that resemble the fingers. Baobab is a deciduous tree and, hence, sheds leaves during the winter. The leaves of baobab reappear either at the end of spring or beginning of summer. The white and aromatic flowers of baobab are large and loosely hanging down and each measuring about 200 mm across. The flowers of baobab appear as large round buds in late afternoon on dangling stalks during the period between October and December. The flowers stay on the tree for just 24 hours before falling on the ground. Initially, their color changes to brown and, subsequently, develop a somewhat foul smell. Baobab flowers are pollinated by fruit bats at night. The baobab fruit is quite large and appears in the form of an egg-shaped capsule, often measuring about 120 mm across. The fruits of baobab are swathed with fine yellowish brown bristles. The exterior of the fruit is a hard and woody dry shell. Inside, an off-white powdery material covers the black, solid, kidney-shaped seeds. This powdery substance is said to be laden with ascorbic acid. This whitish powdery substance is immersed in water to prepare a revitalizing beverage, which reminds one of lemonade. Traditionally, people have been employing this beverage for treating fevers as well as other health problems. Baobab trees have a very long life span and many of them are known to survive for more than 3,000 years. Before dying, baobab trees begin to rot within and finally collapse all of a sudden. These trees possess the aptitude to resist fire, drought and termites. Provided the barks of the trees are stripped, they begin to grow again. As the spread of baobab tree branches resembles a root system, they are often referred to as upside down trees. Some people believe in the superstition that picking the flowers of a baobab tree would result in being eaten up by a lion. Another superstition says that drinking the water that was used to soak the seeds of baobab will protect a person from being attacked by crocodiles. In Africa, baobab is the most extensively found species of Adansonia. Baobab is mainly found in the savannahs of the sub-Saharan regions in Africa where the climatic conditions are hot and dry. Apart from being extensively cultivated, baobab also grows in areas that are widely populated. 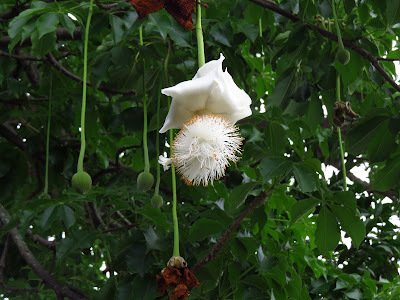 The white flowers of baobab tree are extremely large and heavy. The flowers are very showy and drooping having numerous stamens. The flowers have a rotten smell and studies have found that fruit bats belonging to the sub-family Pteropodinae mainly pollinate the baobab flowers. The fruits of baobab are packed with pulp that becomes dry and hardens before dropping on the ground. The pulp resembles large pieces of powdery, desiccated bread. For several centuries, people have been using the hollow stems of large baobab trees for numerous purposes, including making their houses, storing barns, prisons, constructing pubs and also bus stops. In fact, there is a surprising document that shows that a very big baobab tree located in old Transvaal region was once used in the form of a dairy. There are several such stories in Africa. It is said that another large baobab tree close to Leydsdorp was used in the form of a pub, which was called the Murchison Club. In fact, miners as well as prospectors used this pub during the gold rush era in the latter part of the 19th century. Yet another large baobab tree located in Caprivi Strip was transformed into a toilet, fully fitted with a flushing system. Often, rainwater accumulates in the crevices of large baobab branches and this water is valuable for the locals as well as travelers who generally use it for various purposes, including as drinking water. According to available documents, in some instances people deliberately hollow out the tree’s center with a view to use it as a water reservoir in the rainy season. It is recorded that one such man-made reservoir in a large baobab tree contained 4,546 litres of water! In order to hold the water in such reservoirs for long, people drill a hole into the tree trunk and insert a plug. When they want to retrieve the water they remove the plug. In many places, people also tap the baobab roots to collect water. In fact, the hollows in the trunks as well as the large branches of baobab are also utilized by African honey bees (scientific name Apis mellifera) by making their hives in them. Often, one can find a series of pegs hammered on the baobab trees in the form of a ladder, which are utilized by people who harvest honey seasonally to reach the hives. In Africa, there are numerous legends and superstitions related to the baobab trees. For instance, some people believe that once an elephant scared the baobab’s maternal ancestor and, perhaps this led the tree to grow "upside down". In a number of areas in Africa, people worship the baobab believing that the tree represents fertility. Many people are also of the belief that drinking an infusion prepared with the baobab bark makes an individual strong. In addition, people in some areas are of the belief that a baby boy needs to be bathed in baobab bark infusion, as it will make the child stronger. At the same time, the superstition is that if the boy is bathed with the infusion for a prolonged period, he is likely to become obese. Moreover, they think it is vital that the infusion should not be poured on or touch the boy’s head, as this might result in the swelling of his head. While moving from one place to another, people in Africa usually carry the baobab seeds along with them and sow the seeds near their new homes. Usually, the lower portion of the bark of mature baobab trees is marked with scars, which are caused by the local inhabitants. These people strip portions of the bark and pound it to recover the tough fiber. The bark of baobab is fibrous and is used by the local people for various purposes, including making ropes and mats, sacks, fishing lines, fishing nets and even clothes. 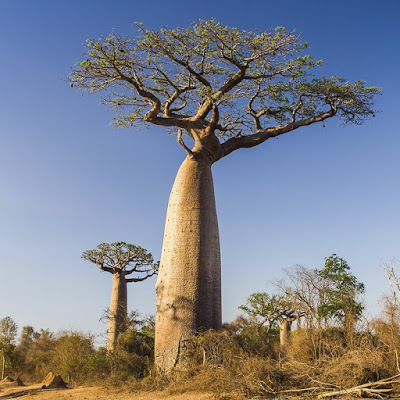 Despite the fact that the bark of baobabs is stripped heavily by both humans as well as elephants, unlike other trees, the baobabs do not suffer due to this. In the case of any other normal tree, this would have led to the formation of ring barking. On the other hand, baobabs possess the ability to continue growing unaffected and over a period of time grow a fresh layer of bark. The wood of the baobab tree has a pale yellowish hue and is soft as well as spongy. While there are reports that the baobab wood has been used to make boxes, these days this practice is not widespread. There are numerous references that highlight the incredible vitality of baobab trees. Some available documents even state that even after an entire baobab tree is cut down, it sprouts again from the roots and keeps growing as usual. In fact, this also hold true for baobab trees that have been uprooted or have died down due to strong storms. These trees also start regrowing from their roots and become large trees again. Such extraordinary vitality notwithstanding, when a baobab tree actually dies, it simply crumples into a big mass of sodden, fibrous pulp. In fact, there are several stories saying that these soggy, fibrous mass decomposes very rapidly and sets on fire on its own, thereby burning it completely. It is said that over 260 years back, people were successful in growing baobabs in England and some of these trees grew up to a height of anything between 5 meters and 6 meters. However, this entire lot of baobabs was wiped out in 1740 due to heavy frosts. Nevertheless, it is surprising to note that a few baobabs have actually been cultivated since then. Perhaps, this is due to the fact that baobabs have an extremely sluggish growth rate. The baobab tree is indigenous to several countries in tropical Africa, counting Botswana, Mozambique, South Africa and Namibia. The native habitat of baobab is hot, arid forest lands on rocky soils having proper drainage and receiving poor rainfall. 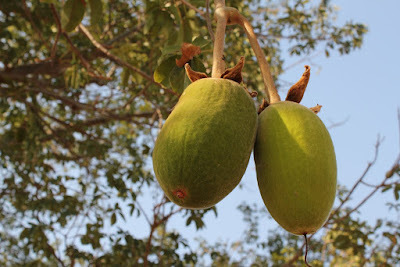 Over the years, baobab has also been planted in several places in India as well as Australia. The baobab tree severs various purposes. The fruit of baobab has been employed in traditional African medicine for treating several ailments, such as fever, asthma, malaria, diarrhea and even smallpox. Traditional African medicine practitioners also use the fruit of baobab to treat inflammation. The baobab fruit is loaded with a number of nutrients like vitamin C and vitamin B2. As a result, this fruit provides numerous health benefits. Baobab is particularly beneficial for pregnant women, elderly people and children. Baobab fruit is known to possess certain therapeutic properties that make it effective in treating fevers and stomach disorders. Of late, several supplement manufacturers have been using the baobab fruits to make fruit juice, energy beverages, dietary supplements and energy bars. Products containing baobab fruit or its elements are being sold as wonderful antioxidant sources. Some people claim that as baobab fruits possess antioxidant properties, using various products made from them may prove to be effective in inhibiting the aging process as well as protecting us from serious ailments such as cardiovascular diseases and even cancer. In addition, it is also being claimed that baobab is effective in protecting us from conditions accompanied by inflammations, such as allergies, arthritis, type 2 diabetes and even heart ailments and various forms of cancer. Apart from these health benefits of baobab fruits, they are occasionally employed in the form of ingredients in various skin-care, hair-care as well as body-care products. A number of personal-care products available in the market these days enclose baobab oil, which is obtained from the seeds of baobab tree. Findings of several studies have revealed that the seeds of baobab fruits are loaded with essential fatty acids like linoleic acid and may prove to be beneficial for our skin. The leaves of baobab tree possess antihistamine and hyposensitive properties. Hence, the leaves of this upside-down tree are employed for treating ailments related to the kidneys and bladder. They are also used to treat asthma, diarrhea, common fatigue, guinea worm and insect bites. Infusions prepared from the leaves as well as flowers of baobab are also said to be effective in curing respiratory problems, eye inflammation and problems related to the digestive tract. A paste prepared from baobab seeds is employed to treat tooth as well as gum diseases. The seed, fruit pulp and the bark of baobab are well-known antidotes to poisoning caused by Strophanthus. The bark of baobab tree yields a gum that is employed for cleansing sores. The bark of baobab also possesses diaphoretic and expectorant properties and used for these purposes. Many people use the baobab bark in steam baths with a view to mitigate high fever and shivering. A decoction prepared from the roots of baobab is used internally for treating lethargy, impotence and kwashiorkor (an aliment caused by malnutrition). The bark of baobab is also boiled in water and taken internally for treating body aches. An infusion prepared from the bark is used for treating fever, colds and influenza. The seeds of baobab fruits are used to treat diseases related to the kidneys, digestive tract and joints. This remedy is prepared by roasting the seeds and grinding them into a powdered form, which is used to cover the affected area. Alternatively, the powder may also be taken internally with water. The fruit of baobab is beneficial for those trying to lose additional body weight. The fruit affects the starch digestion as well as the glycemic response, thereby helping to lose weight or obesity. Consumption of foods rich in vitamin C has been found to be effective in a number of cardiovascular diseases, such as venous insufficiency and varicose veins. Hence, incorporating the baobab fruit extract in one’s diet helps to cure these health conditions. Precisely speaking, vitamin C is essential for collagen and elastin production in our body. Vitamin C is also needed for manufacturing connective tissues which are responsible for sustaining the strength as well as the tone of the veins. Hence, it does not come as a surprise that diets low in vitamin C content are often responsible for varicose veins. It is believed that consumption of vitamin C alongside vitamin E helps to promote the health of veins and make them stronger. Therefore, it is advisable that when you mix a smoothies containing baobab fruit pulp powder next time, ensure that you also include a vitamin E source like ground walnut - a super food, along with it. The baobab tree is also an excellent source of fine grade honey. In fact, wild bees pierce the baobab’s soft wood and store the honey collected by them in the holes. In several regions of Africa, people also use the hollow trunks of baobab trees for beekeeping. The wood of baobabs is also excellent for use as fuel, as they have long fibers appropriate for firewood. In fact, people in Africa also use the fruit shells and the seeds as fuel, especially by potters who use these to make their earthenware necklaces smooth prior to firing. One can remove the lower part of the bark of stems of relatively younger baobab trees as well as those of the roots and use it to make a useful fiber. Provided the trees are managed properly, they will not be damaged even after removing their bark, as it regenerates and can be removed again after gap of a few years. The fiber obtained from baobab bark is employed to produce excellent quality ropes, cordage, mats, harness straps, fishing lines and snares, string tethers of various musical instruments, fiber cloth, bow strings and bed-springs. People in Ethiopia as well as Senegal use the fiber to weave waterproof hats, which are also used as drinking vessels. In Kenya, people also use this fiber to make the well-known "kiondo" baskets. In fact, the baobab bark fiber is excellent for this purpose. The fiber is also used to manufacture a sturdy, tough and tear-resistant paper. In India, this paper is used commercially to produce currency notes. The seeds of baobab are distilled to produce golden yellow, non-drying oil having a pleasant flavour. People in Senegal use this oil during festivals and ceremonies. In Tanzania, villagers in Bicha and Mondo use the seeds of baobab in place of cooking oil. In Tanzania, people belonging to the Wasandawe community obtain a liquid from the fruit pulp and use it to brew beer. Even in Kenya, members of the Akamba tribe use the seed pulp in the form of a fermenting agent in locally-made beer. Some parts of baobab are also used to repel insects. For instance, many people in Africa boil the baobab bark for several days to haul out a substance that is toxic for ants. When burnt, the fruit pulp emits an irritating, acrid smoke, which is used to keep insects that trouble livestock at bay. The ash obtained after burning the bark, fruit shell and seeds of baobab are loaded with potash, which is extensively used in manufacturing soap. These soaps are prepared by boiling the baobab bark and the ash of the plant’s fruits in water. People in Africa also use the baobab fruit shells for various purposes, including as a water dipper, dish, vessel for storing and drinking liquids, fishing float and even snuffbox. Interestingly enough, the shell is also excellent for making a rat trap. The peduncle (powdered husk) is often smoked as a substitute for tobacco. Alternatively, many also add the powder to snuff to augment its sharpness. In addition, an extract from baobab fruit pulp is often used in the form of a hair wash by the local populace. For long people have been using the baobab tree in the form of an alternative plant-based compound to keep mosquitoes away. It has been found that the leaf extract of baobab tree (Adansonia digitata) contains chloroform, benzene, methanol and hexane, which have larvicidal as well as repellent activities. In fact, scientists have studied the action of the leaf extract against Anopheles stephensi, a malarial vector. At the end of the study, scientists found that A. digitata possessed both larvicidal plus mosquito repellent actions against Anopheles stephensi. Hence, they concluded that this extract possessed mosquito controlling properties and could be used for the purpose. The leaves and fruits of baobab are also used for culinary purposes. The leaves of baobab are said to contain high concentrations of sugars, calcium, potassium tartrate and vitamin C. Many people consume them after cooking them as a fresh vegetable. There are others who dry and crush the leaves and use it later. On the other hand, sprouts of young baobab trees can be consumed like one eats asparagus. Even the roots of very young baobab trees are edible. One can also consume the seeds after roasting them. They can be used as a substitute for coffee. The white powdery substance found inside the baobab fruit, which is considered to be the fruit pulp, is also edible. This powdery substance is loaded with several vitamins, especially vitamin C and vitamin B2. It can be soaked in water and drank in the form of a refreshing drink. People collect the ripe baobab fruits and crack their hard shell to obtain the flour (the white powdery substance), which is blended with milk for preparing a kind of flavourful fermented porridge. The tender leaves of baobab tree are also packed with vitamin C. In addition, they contain high concentrations of uronic acids. In fact, baobab leaves have a great demand in many places in Western Africa where people use them as a vegetable in soups. In a place called Ferlo in North Senegal, people use an extract of baobab leaves, locally called "lalo", in couscous or millet porridge. It is said that adding the leaf extract makes the couscous smooth. Many people in Africa also consume the small stems as well as the roots of baobab seedlings in the form of a vegetable. In many parts of this continent, people also cook the mature and dense roots of the trees when other foods are scarce during famines. The roots of baobab are also used to prepare a decoction, which is extensively used as a food in Sierra Leone. To prepare this decoction, locals boil, roast and then soak or ferment the roots. The preparation is said to be flavourful and tastes similar to almonds. As the baobab tree contains high percentage of water, animals and even humans often chew its wood when there is water scarcity in these regions. In addition, the wood from baobab tree can also be used as a substitute for salt. The pith of the tree is acidic and it is used in place of cream of tartar for baking, preparing smoked fish and curdling milk. The seeds of baobab fruits enclose significant amounts of potassium bitar and tartaric acid. Therefore, the seeds are not only refreshing when they are sucked, but also make a flavourful beverage when they are soaked in water.